By 2020, CARE and our partners will support 150 million people from the most vulnerable and excluded communities to overcome poverty and social injustice. For measuring these impacts, CARE has selected a total 25 impact, outcome and change indicators, used for tracking progress toward our goals. We selected based on Sustainable Development Goal (SDG) indicators and feasibility of measurement. By selecting SDG indicators, we will be able to show the extent to which we contributed to advancing toward these goals. This page presents CARE’s impact from FY15 to FY18 as we progress toward the 2020 Program Strategy targets. Our strategy also states that CARE is committed to tackling the underlying causes of poverty and social injustice by strengthening gender equality and women’s voice, promoting inclusive governance and increasing resilience. We have prioritized three roles: humanitarian action, promoting lasting change and innovative solutions and multiplying impact (including advocacy). In November 2018, we shared extensive data about Participants reached in FY18, markers for the CARE approach and roles, which you can find on the CARE MEL wiki. This is why this paper focuses on impact data only. 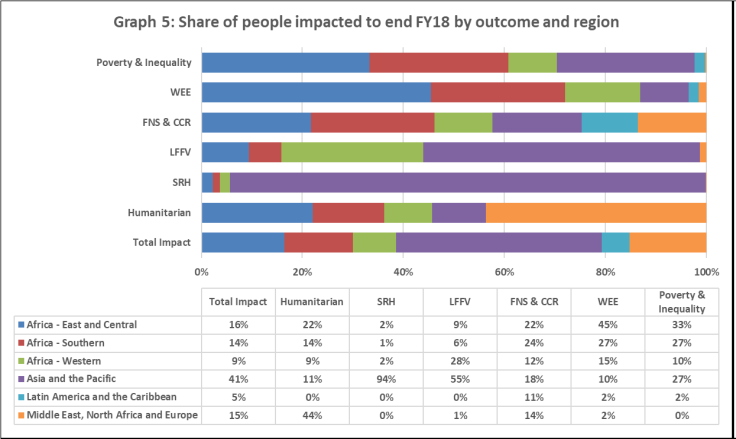 The Impact Figures for FY18 provide data by region, country, CI member and donors. This data is essential for investing in programs with greatest impact-potential. 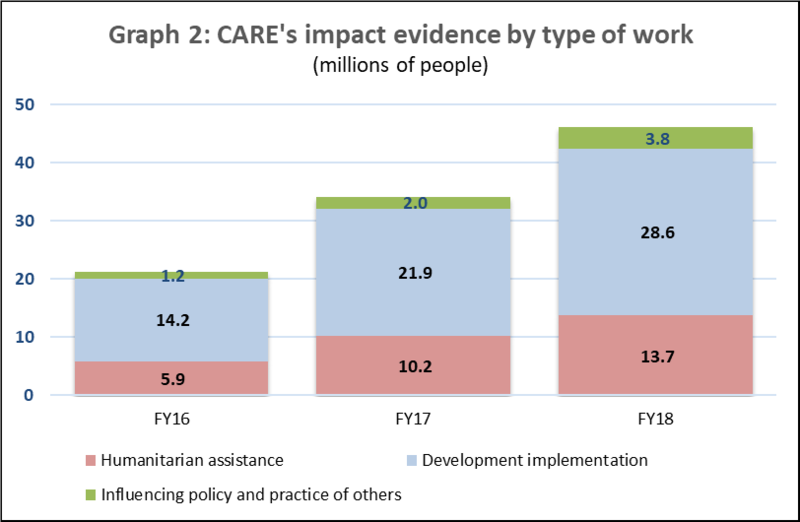 As can be seen below, by FY18, CARE obtained evidence of contributing to reducing poverty and social injustice for over 46 million women, men, girls and boys in 68 countries. Since the start of the Program Strategy, CARE obtained impact evidence from 713 projects. However, more than 800 projects ended without clear impact figures. For these projects, the estimated underreported impact is of 18 million people. Therefore, CARE’s total impact from FY15 to FY18 stood at an estimated 64 million people. Based on the current program portfolio, CARE is expected to contribute to impacts for 36 million people in the FY19 and FY20 period. This would leave an impact gap of 50 million people of our expected target. At current programming levels, CARE will have reached two-thirds or 67% of its 2020 target. Is there reason for concern? The key to addressing the impact gap is carrying out a better, and deeper, analysis of the impact of CARE’s advocacy and scale up actions. Most of CARE’s advocacy and scale up initiatives do not provide sufficient evidence on the extent to which, and for how many people, we contributed to change. A few promising examples indicate that by better measuring the impact of these initiatives, we will be able to paint a fuller and clearer picture of CARE’s contributions to tackling poverty and social injustice. 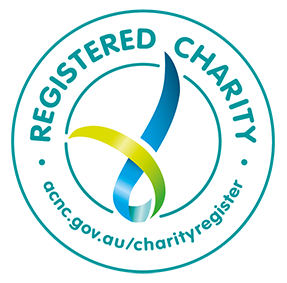 The adoption of the Advocacy and Influencing Impact Reporting (AIIR) Tool has been a major step in applying consistently a tool to capture advocacy-influencing wins across CARE. As shown in Graph 2, in FY18 we continued to increase the evidence about the impact of CARE’s policy influence. For specific outcomes, it is expected that CARE will surpass its humanitarian outcome of 20 million people (by approximately 10%) but will fall short of others, particularly Sexual and Reproductive Health and Rights, the Right to a Life Free from Violence and Women’s Economic Empowerment. 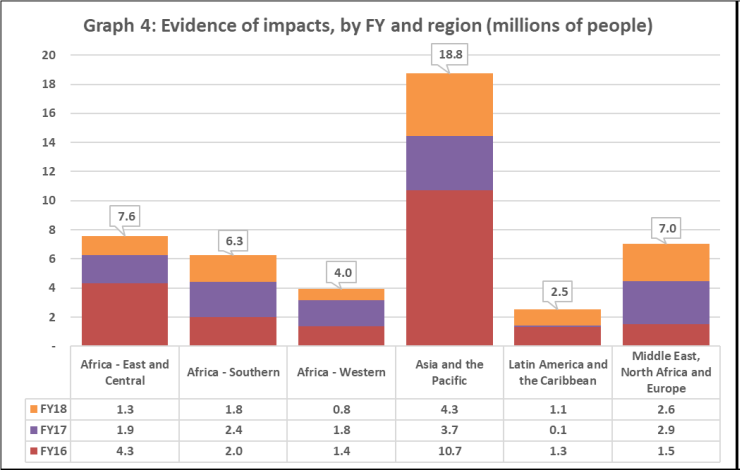 Graph 4 shows the number of people impacted by region. 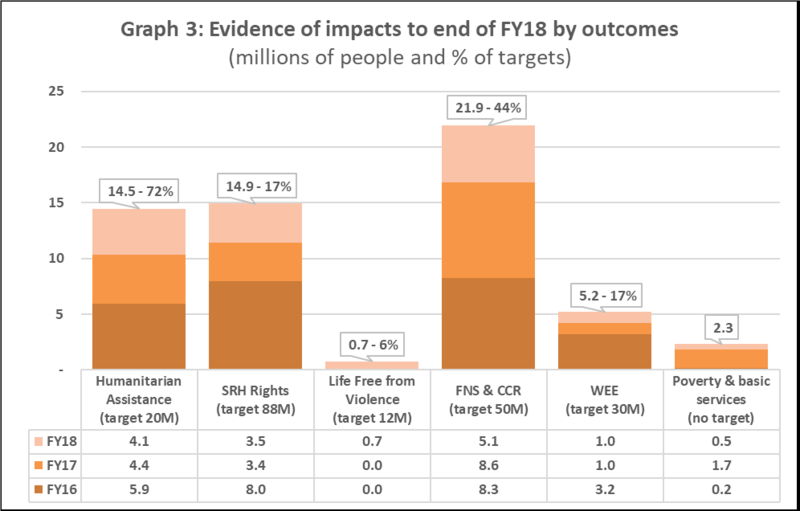 By the end of FY18, CARE’s programs had an impact on nearly 19 million people in Asia and the Pacific and 18 million people in all African regions. In the Middle East, North Africa and Europe, CARE had an impact on 7 million people since the start of the Program Strategy period, and in Latin America and the Caribbean on 2.5 million. The majority of people who experienced women’s economic empowerment impacts through CARE’s programs resided in Africa (87%). People impacted by CARE’s food and nutrition programs were spread across all regions. Most of CARE’s impacts on the Right to a Life Free from Violence and Sexual and Reproductive Health were in Asia and the Pacific. For humanitarian response, 44% of people impacted resided in the Middle East, North Africa and Europe. 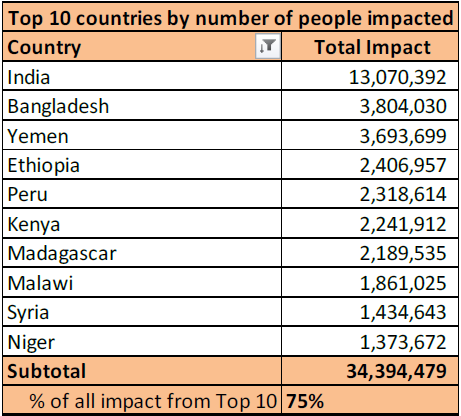 The top ten countries in which CARE had evidence of impact accounted for 75% of all of CARE’s impact to the end of FY18 (India, Bangladesh, Yemen, Ethiopia, Peru, Kenya, Madagascar, Malawi, Syria and Niger). 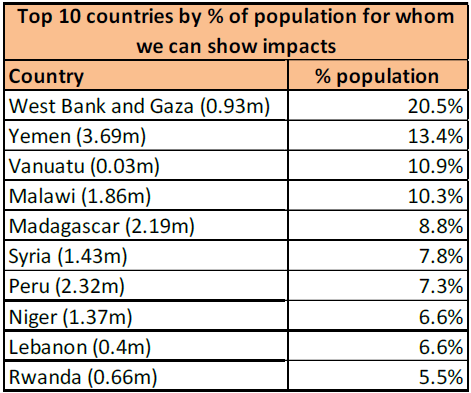 The West Bank and Gaza was the country where programs had the largest impacts as a proportion of the total population of the country (one-fifth of the population), followed by Yemen, Vanuatu, Malawi and Madagascar. – Where and why are we having impact? What do we need to do more of, less of? What do we need to stop doing? – Do our most transformational programs in gender equality and women’s voice, inclusive governance and resilience have a greater impact? What have we learned? Measuring the impact of advocacy and scale up. Identify, gather and analyze data from our main advocacy initiatives and programs with scale-up strategies. Advocacy sub-team of the MEL Group. Analyzing strategies for increasing impact. CI Members have invested in several strategies for increasing impact, such as Impact Growth Strategies, ScaleXDesign, advocacy investments, etc. It is central to assess which of these strategies and investments have been most successful in increasing CARE’s impact. Program Strategy Team, MEL Group, PQI SLT. Learning from most transformational projects and initiatives. A low proportion of projects is transformational on gender, inclusive governance and resilience. It is central to learn from these projects and assess how their lessons can be applied to others. Program Strategy Team, MEL Group (particularly MEL approach leads). Investing in solid impact studies and quality M&E for most strategic programs, especially where such evaluations are not planned. Increase level of impact measurement for FY19-20. Despite progress, some CARE programs end without an impact study. All CI Members. We will work to continue improving CARE’s impact data in order to obtain a more complete picture of the difference we are making worldwide. Despite some of the gaps, CARE has made massive progress in gathering and analysing its impact and is, in fact, ahead of all other peer International NGOs in being able to portray a global picture of its impact, rather than just its reach.